Members of the Cheshire West and Chester Council Youth Senate and the UK Youth Parliament visited the House of Commons last week to debate the top issues raised by young people in the national annual Make Your Mark ballot. 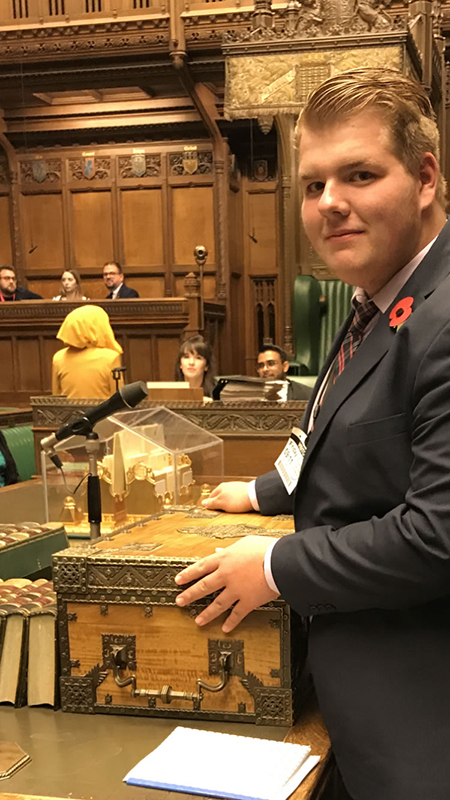 Jessica Leigh from Wincham and Tommy Wallis from Ellesmere Port, aged 17 and 15, travelled to London to take part in the UK Youth Parliament debate on Friday 9 November. Councillor Meardon, Cabinet Member for Children and Families, said: “This was a fantastic opportunity for our young people. To be able to take part in a debate in the House of Commons is amazing. Our Youth Senate members are truly inspiring and this experience is invaluable. The Youth Senate worked in partnership with The British Youth Council earlier this year to encourage young people, aged between 11 and 18, to take part in Make Your Mark.